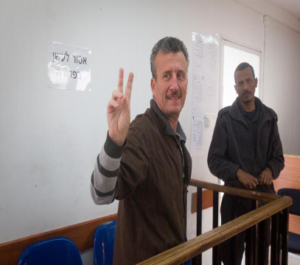 After nearly a year in Israeli jail, standing trial for charges pertaining to protest organizing in his west bank village of Nabi Saleh, Bassem Tamimi was named prisoner of conscience by Amnesty International. In its statement the organization called for Tamimi’s immediate and unconditional release. Tamimi’s next court hearing will take place this Sunday, March 5th, 10:30 AM at the Ofer Military Court. 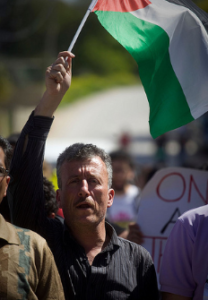 “Palestinian human rights defender Bassem Tamimi is a prisoner of conscience, detained solely for his role in organizing peaceful protests against the encroachment onto Palestinian lands by Israeli settlers, and should be released immediately and unconditionally”, Amnesty International said today. “The Israeli army has repeatedly used excessive force in countering these demonstrations, as a result of which the organizers reiterate instructions for Palestinian demonstrators to adhere to non-violent methods. Occasionally, individual protestors have engaged in throwing stones at soldiers. One such protestor, Mustafa Tamimi, was shot in al-Nabi Saleh on 10 December 2011 by a high-velocity tear gas projectile fired at his head at close range from an Israeli military jeep. He died the next day in hospital”, the organization’s press release added. Since the beginning of the village’s struggle against settler takeover of their lands in December of 2009, the army has conducted more than 80 protest related arrests. As the entire village numbers just over 500 residents, the number constitutes approximately 10% of its population.